horizontally outside my living-room window. Putting away my shorts and sandals from the warm weekend only a few days earlier, I bundled up and braced myself from the nippy wind as I headed out the door for work. On the radio in the car, the weather was the talk of the day. I wondered briefly if I needed to put my after school plans on hold. The school gardens desperately needed pruning and new perennials were needing to get into the ground before it froze. I had set aside this time to do the job and had one co-worker and 2 student’s parents committed to helping. “I don’t think this is the right day,” said Irene as soon as I saw her that morning. I was undeterred, however, and said she was free but that I would brave the mud and wind. She looked at me like I was crazy and I said we’d talk again at lunch. The blustery weather began to wear my resolve away and by noon I realized Irene was right. My plans would have to wait a week. All of this set the stage for one of the nicest things that happened this week. I hadn’t had time to tell one of the parents that the plans were off for now and at 3:30 she showed up at my class door. As usual, it had been a busy day. Crazy weather always affects the students, and lessons had felt a bit like an uphill battle, especially a math lesson in which I was learning a new method of assessment. 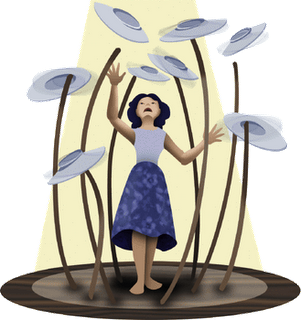 Teaching is a challenging task at the best of times, like those circus acts you see with someone balancing ten teacups with two hands and spinning a plate on a stick on their teeth! Add something into the mix like picture day, or blustery weather, or a full moon (honestly the list is endless) and it’s a task for a saint or a fool! And I’m no saint. So when this parent showed up, I was exhausted. The thanksgiving list I’d meant to write for my weekend blog was far from my mind. But I almost teared up on the spot when Crystal showed up. Spade in one hand and pitchfork in the other, she was dressed in her long winter coat, mitts and rubber boots. Actually, I found myself surprised that she still assumed the plans were on. The next morning before work, I was reflecting on this moment with my cup of coffee. Feelings of exhaustion can make a person feel like throwing in the towel, but this simple act was like a ray of sunshine, injecting hope into my day. Her gift of encouragement and support came just when I needed it, nudging me to stay with the program and remember all the kindness in the world which helps us soldier on in difficult circumstances. As I write about it even now, it draws tears. A co-worker giving an understanding word in passing in the hallway. Thank you Shauna. Another co-worker who kindly gave me her prep last Friday so I could leave early for my retreat. Thank you Monica. Amid all the ebb and flow of classroom events, I am constantly grateful for those moments that are “easy” – where genuine learning happens, or kind words are spoken, or energy is there and magic happens in the lesson. These moments remind me of why I’m sticking with teaching. Having an honest talk with Lyle one evening and our relationship being able to sustain sometimes tricky conversations. I’ve been very grateful for the laughter that still flowed later, and for the same path we are on together. Thank you Lyle. Seeing gorgeous fall colors and swirling leaves that rain down like snow. Thank you Creator. On a freezing day, the farmer’s market is still open and we’re still able to pick up our luscious farm produce from our CSA share. When it feels like the ceiling is coming down and life feels crowded, bounty reminds me of the truth. Thank you Jonathan of Jonathan’s Farm. Friends who stir up faith and kindness at our Wednesday night Watershed meeting, reminding me of the bigger picture. Thank you Watershed. Prayers with these same friends at the end of the meeting, and words of faith that spill out, reminding us of our desire to follow God. Thank you everyone. An email from Paul P., who generously answered my query with characteristic wisdom and love. Thank you Paul. 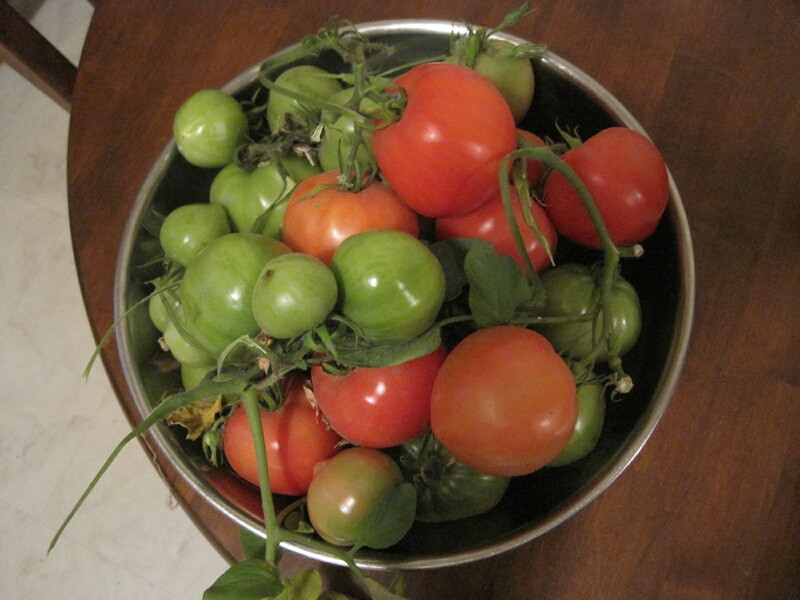 A beautiful bowl of tomatoes finally harvested from my humble garden. The lovely colors glow in a silent reminder of the beauty in life. Thank you Creator. I had originally intended to write my blog post on the Josh Garrels concert that Lyle and I went to in Vancouver. This post will still be written one day no doubt, but in the meantime, I had been feeling so grateful this week for this fun holiday and wonderful concert with Lyle. Thank you Lyle and Josh Garrels. Seeing my students enjoy Friday’s field trip to Oak Hammock Marsh thanks to some great staff people there, despite the crazy weather. Thank you students. Former students who come to see me after school. Thank you. A book about C.S. Lewis that I don’t want to end because it is so good. Thank you writers everywhere. Another inspiring article on the love of books by the late Ray Bradbury. It was the last thing he ever wrote. Thank you Ray Bradbury. All these gifts are exactly like Crystal showing up at my door, tools, kindness and enthusiasm ready to match the oft daunting challenges life gives us. I am grateful for these gifts which are like air and food, helping me stay on the path of faith and hope. As you enter the Thanksgiving weekend, may you be inspired to reflect on your own list of “small things” and be encouraged on your own path. Whether you call yourself a “Christian” or not, I am convinced that God gives us all a never ending list.